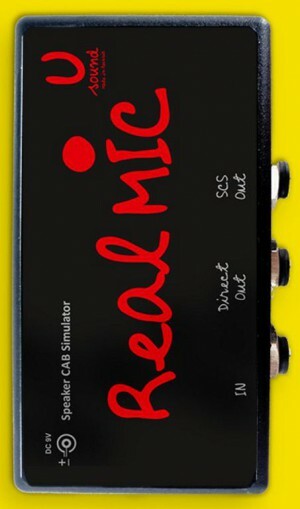 "Real Mic" - it is simply a necessary assistant to any professional, or household guitarist. In fact, this device forms the perfect frequency response of guitar dynamics. This chain of active filters can approximate the sound from the output of the device to reproduce the sound of a guitar cabinet. Everyone knows that in clubs and other venues where you perform and play guitar, there is not always a decent guitar combo amp to plug in to or a bass rig. But when you switch over to the output of the “Real Mic” to the input mixer, you can get a very decent sounding tonal instrument, even in the absence of performing on a combo. Another application: when you are recording your instrument at home and you need to plug in to your computer’s sound card. Most of the samples pedals U-Sound is recorded with this particular Stompbox. The pedal is very compact, convenient and easy to use! Built-in power supply voltage doubler to increase Headroom. Terms of manufacturing and the price is discussed individually.